After presenting the current state of the U.S. penny and U.S. nickel, the post presents some of the central aspects of medieval coinage before showing how the sterling silver penny and the U.S. copper penny are related. The post also argues that the English mint managed the silver content of the sterling penny to help ensure that it stayed in circulation. Debasements helped preserve a healthy monetary system but also clashed with the premises of a commodity-based monetary system by emphasizing the importance of the nominal anchor provided by the official nominal value of the coinage, and by deemphasizing the real anchor provided by the precious metal content. This clash between liquidity concerns and purchasing power concerns remains an unresolved issue. One way to get a glimpse at the monetary dynamics of the Middle Ages is to study recent monetary developments surrounding two U.S. coins, the U.S. penny and the U.S. nickel. The “nickel” is the nickname of a coin with an official value of five cents. It has usually been made of a quarter of nickel and three quarters of copper. The “penny” is the nickname of a coin with an official value of one cent. Since its inception, the U.S. penny has been debased by lowering the weight and/or fineness of copper (Table 1). Table 1. The U.S. penny: 1793 to today. Note: Avoirdupois pound (453.59 g.) used to calculate the mint equivalent. A limited number of copper pennies were produced in 1943. The intrinsic value of each coin is easy to compute from 1980 because data about coin weigh, metal composition, and global prices of metal are available. The following two graphs show the official value (face value) and the intrinsic value (metallurgic value) of both coins from January 1980 to June 2017. The commodity boom of the early 2000s led to a surge in the price of copper, zinc and nickel and by the mid-2000s, intrinsic values were above official values. This was brief for the post-1981 penny, lasted intermittently for about five years for the nickel, and has been virtually permanent for the pre-1982 penny. 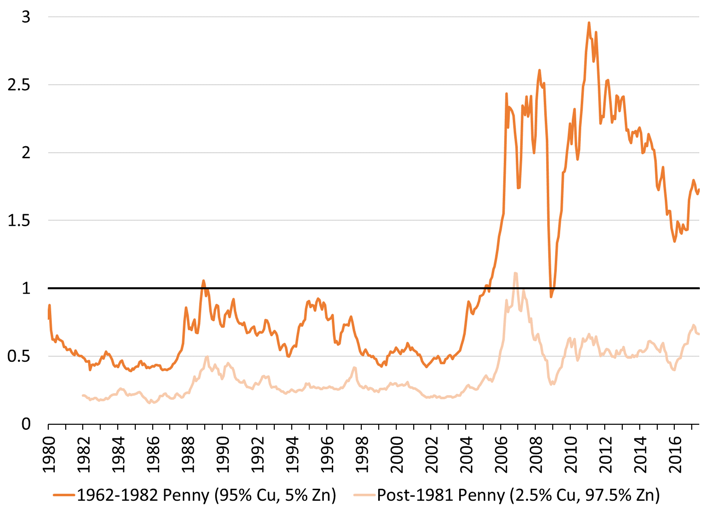 The intrinsic value of the pre-1982 penny peaked at three times its face value in 2011, and the intrinsic value of the nickel was almost twice as high as its face value in 2007. Note: Intrinsic value of pre-1982 penny = .95*(price of copper*quantity of copper) + .05*(price of zinc*quantity of zinc). Change the proportions to get the intrinsic value of the post-1981 penny. Unlike in the Middle Ages, it is not possible to arbitrage away this discrepancy. Individuals are not allowed take a U.S. coin and sell it (to a scrap metal dealer, a jeweler, or anybody else interested in the non-monetary uses of copper) at intrinsic value. While someone could export the penny and the nickel, the U.S. government has placed limit on exports of these coins and any infraction is punishable by five years of imprisonment and/or a $10,000 fine. Since 1974, the melting, treating, and mass exporting of U.S. pennies has been forbidden; the law was updated in 2006 to include the U.S. nickel. Some individuals expect that the U.S. congress will demonetize the penny and are anticipating that decision by hoarding pre-1982 pennies. Some spend their evenings triaging boxes of pennies by hand, while others use more or less advanced machinery to do so. Readers interested in a direct comparison of the U.S. copper penny with the sterling silver penny can directly go to the last section. For novice readers of medieval monetary mechanics, the following sections provide the background necessary to understand the last section. 1 l. = 20 s. = 240 d.
One libra/livre/pound sterling is equal to 20 solidus/sous/shillings and 240 denarii/deniers/pence sterling. Until the 12th century in Europe, official mints only issued one monetary instrument denominated in that unit of account, a coin with an official nominal value of 1 d. The generic name for this coin is “penny” although it may have gone by a different name (e.g., “denier” in France). Two premises underlined the monetary system. The first was that the weight of a coin should be proportional to the place of a coin in the denomination structure, and the second was that coins ought to be made of a precious metal, silver at the time. One pound is equal to 12 ounces and 240 pennyweights. As such, the penny coin should be worth 1/240th l. and should weight 1/240th lb. If a coin with a denomination of 1 l. had existed, it ought to have weighed 1 lb. This one-to-one relation between the count and the weight was seen as convenient for the circulation of the coinage because one no longer needed to weigh coins to transact. Coins could just be counted (circulate by tale) as long as individuals trusted that the coins in circulation met their official weight and fineness. The official weight standard changed overtime and by geographical area, so the meaning of “a pound” is not straightforward. A Carolingian pound was equivalent to 489 grams. From the 8th century to 1526 the Tower pound prevailed (1 tower lb. = 350 grams) in England, after which it was replaced by the Troy pound (373 grams). King Offa’s pennies weighed 1.46 grams and were struck out of a pound weighing 350 grams, which yielded 240 pennies per pound of metal. The second premise implied that the pound of metal used to produce 240 pennies ought to be made of as fine silver as possible. According to Carolingian and Anglo-Saxon kings, a sterling pound is an abstract representation of a pound of fine silver. This objectified an abstract measure (pound sterling) into a valuable material (pound of silver). This was thought to be important to promote price stability and to create trust in the monetary system. People trusted precious metals and were unfamiliar with monetary transactions, they did not trust or understand basic finance, nor did they trust the creditworthiness of their king. People also trusted that the mint made coins according to the official weight and fineness. Mints needed silver (and later other metals) to make the coins. The silver could come government-controlled mines but moneyers relied also on merchants and other individuals selling silver to the mint. Silver sold to the mint took the form of ingots, silver objects, domestic silver coins no longer current and foreign silver coins. Different minting arrangements existed throughout history to ensure that, willingly or not, individuals sold silver to the mint. This post assumes that free minting applies, that is, anybody is free to sell, or not sell, silver to the mint at any time. The mint paid for the silver received with the coins struck out of it. The price at which the mint bought silver is the mint price, the official price of silver in a country. The monetary value of the coins struck out of a pound of metal is called the mint equivalent. The mint price and mint equivalent can be calculated for different fineness of silver. Given that mints did not struck coins out of a pound of pure silver, it is convenient to measure them for a pound of standard silver, that is a pound of silver that meets the official fineness. The inverse of the standard mint equivalent is the weight of a coin. Assume that 240 d. worth of pennies were minted out of a pound of standard silver and 230 d. worth of them were given back to the silver supplier. The difference between the mint equivalent and the mint price is the gross seigniorage imposed by the king to cover the cost of production (brassage) and profit of the king (net seigniorage). 240 d./lb. = 230 d./lb. + 10 d./lb. If halfpenny coins are struck, they ought to contain twice as less silver as a penny coin, and their official value ought to be 0.5 d. The mint equivalent is still 240 d./lb., the mint price of silver is still 230 d./lb., but 480 coins are produced and 470 are returned to the metal supplier. 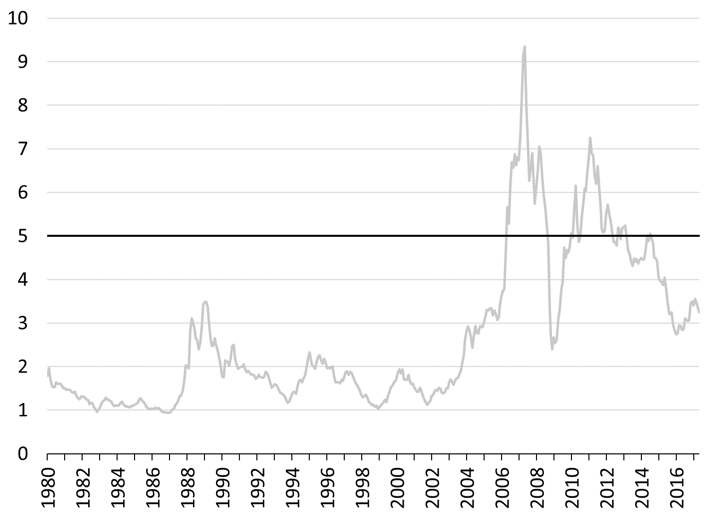 If the mint price rose, the mint equivalent also would tend to rise to preserve gross seigniorage. The stronger the royal control over the coinage, the larger the seigniorage. During Carolingian times, a quarter of the penny coins produced out of a pound of silver were kept by the mint. Silver was an international commodity moved among countries by governments, merchants and arbitrageurs. While in England the mint price may be 230 d./lb., it may have been 350 d./lb. in France. Assuming that only these two countries exist, one might think that the market price of silver would fluctuate within the band [230 d., 350d.]. The band, however, was porous because mints did no implement a full buffer stock policy to control the price of silver. While mints did buy silver on demand at the mint price, they did not sell silver on demand, so there was no means to prevent the market price from rising above 350 d.
Early Carolingian and Anglo-Saxon kings designed a commodity-based monetary system with a tight connection between a unit of account and a silver weight standard. Each penny coin was made of 0.95 or more fine silver and weight 1/240 lb., so a pound sterling was almost the same thing as a pound of pure silver. Overtime, the sterling penny coin was mostly debased and so its official value (1 d. or 1/240 l.) became more and more disconnected from its weight and quantity of silver. By 1465, a penny was still worth 1/240 l., a pennyweight was still 1/240 lb., but the sterling penny coin only weighed 1/450 lb. By the early 17th century, the coin weighed only 1/744 lb., almost three times lighter than in the 13th century. In England, most of the debasement took the form of a lower weight (higher mint equivalent) and was slow relative to the rest of Europe. Fineness did decline at times but the English penny was usually made of 0.925 fine silver (92.5 % silver, 7.5% alloy). The commitment to a “strong” penny (relative to other countries) was a peculiarity of English politics. Debasements created a dilemma because the unit of weight and the unit of account progressively became more and more distinct. A question emerged, should monetary transactions follow the unit of weight or the unit of account? In terms of the unit of account, the value of the penny coins is unchanged by a debasement, it is 1d., and so no adjustment is needed. In terms of the unit of weight, a penny now weighs less than a pennyweight, and so extra pennies should be provided to compensate for the discrepancy. Assume that yesterday Mr. X borrowed 8 d. from Mr. Y. and that today the weight of the penny coin drops from 1/240 lb. to 1/480 lb. while fineness stays content. If one follows the unit of account, the debasement is inconsequential, tomorrow Mr. X. just need to hand eight penny coins to Mr. Y. If one follows the unit of weight, X owes a given quantity of silver not a given nominal sum, so Mr. X should give sixteen penny coins to Mr. Y. It was frequent for debtors and creditors to go to court in order to settle this question, especially when debasement (or reinforcement) occurred before a contractual obligation had been fully paid. Courts would side with Mr. X (X owes 8 d.) if it followed nominalism (the official sterling value of a coin is the point of reference to settle debts). Courts would side with Mr. Y (X owes 16 d.) if they followed metalism (the content of silver in a coin is the point reference to settle debts). The table below shows the physical change to the silver penny between 1158 and 1796. One may note that the table only shows the official weight and fineness of a silver sterling penny coin. The actual weight and fineness of sterling silver pennies was probably lower than the official standards for multiple reasons including wear and tear, no penny coins struck in the period (for example 1335), existence of counterfeits, clipping, sweating, rudimentary production methods, fraud, among others. Table 2. Characteristics of the sterling silver penny coin. Source: Bolton’s Money in the Medieval English Economy: 973-1489, Reddish’s Bimetallism: An Economic and Historical Analysis, Jastram’s Silver: The Restless Metal (data available here: “Silver value of £ 1273-1977”). Note: Jastram defines mint prices as “the face value of the silver coinage into which the Mint was obligated to coin a given quantity of metal” (Silver: The Restless Metal, 163). This is what Reddish calls the mint equivalent and Jastram’s mint price data usually matches closely Redish’s mint equivalent data. Note: Mint equivalent of a pound of standard silver = official value of a penny/official weight of a penny. For example, between 1158 and 1278, a penny coin ought to weigh 0.047 troy oz. so 1/.0047 gives the number of coins produced with one troy oz. of standard silver. 1d./0.047 oz. gives the mint equivalent in pence sterling per troy oz. and (1d./0.047)*12 gives the mint equivalent in pence sterling per troy lb. The mint equivalent of pure silver is official value/content of silver = official value/(weight of silver penny*fineness of silver). Note: Unadjusted mint equivalent does not correct for the change in the weight standard that occurred in 1527, when Henry VII abolished the Tower pound. This column gives the true number of pennies that were struck of out of pound of standard silver, whatever that pound was. For example, under King Offa in 760s/770s, the mint made 240 penny coins per Tower pound (350 g.). Given the official weight of the penny in grams (1.46 grams), the equivalent of 240 d. per Tower pound is 255 d. per Troy pound (373.24 g.). In the Table, the unadjusted mint equivalent is calculated as 350 g./official weight in gram until 1526, and 373.24 g./official weight in gram after 1526. It is a stylized fact that commodity-based monetary system are subject to a steady debasement. There are several reasons for that and a few of them are discussed below. The first cause, and a main culprit for the long-term trend in debasement, was wear and tear. Silver is a soft metal and circulating coins lost about 2 percent of their metal content every decade. If the difference in metal content between new and old coins was significant enough, there was an incentive to hoard the new (heavier) coins. This was a problem because the King may refuse light coins in payments of royal dues, or may require a compensation for the discrepancy of weight and fineness. If the courts followed metalism, creditors could also do the same in private transactions. To solve the problem, the mint could periodically order a reminting of the entire coinage to bring it back up to the official standard. However, another less costly and faster means to deal with the problem was to raise the mint equivalent to ensure that that the weight of new coins matched the weight of old coins. Hoarders of heavy coins would profit from such debasement, which would reinforce the incentive to hoard heavy coins in anticipation of further debasements, especially if they were frequent. A second cause was the scarcity of silver relative to the needs of an economy that became more and more monetized. While financial techniques were developed to improve the efficient use of an outstanding quantity of coins, ultimately the quantity had to grow. Unless mines could keep up with the demand and unless a country had a favorable trade balance and/or attracted foreign silver because of a competitive mint price, the coinage could not grow fast enough relative to the demand for coins. One means to accommodate the demand is to make more coins out of a pound of silver, that is to raise the mint equivalent. A third related cause was the fiscal need of the king. This was especially true in times of wars that were fought abroad. Expenses ran high and payments to soldiers, mercenaries, among others, led to an outflow of silver from the domestic economy. A convenient way to meet the fiscal needs was to debase the coinage. A fourth cause was illegal debasement through clipping and sweating. This was done by the population as well as by moneyers without the consent of the king. However, the King was at time in on the fraud when he secretly ordered the mint to lower the fineness of a pound of silver so more coins could be produced (and kept by the King) out of a given mint equivalent. This fraud was especially costly to the population because it punished taxpayers for the king’s fraudulent behavior. Fineness was tested when tax famers brought the coins they collected. One way to do so was to take a sample of 240 (or whatever the mint equivalent was) sterling pennies, melt and refine them, and then weigh the ingot against the Exchequer pound weight. If the ingot was lighter, tax farmers owed an additional sum proportional to the extra coins needed to balance the scale. Tax farmers would pass that cost onto the population if they anticipated it. A fifth source of debasement involves errors when setting up the coinage. Assume that half penny coins and penny coins are issued by the mint. Any mismatch between the content of silver and the denomination structure generates an arbitrage opportunity. If a penny coin contains 1/240th lb. of silver and a halfpenny coin 1/360th lb. of silver, it is profitable to melt halfpennies and bring them to the mint to get pennies. With three coins that together are worth 1.5 d., one can get two coins that together are worth 2 d. Halfpenny coins would disappear unless the penny coin is rebased, or the halfpenny coin is debased, to reflect the denomination structure. A final source of debasement relates to domestic and international arbitrages induced by the rise in the price of silver. If economic units are able to get penny coins minted on demand by simply bringing the required metal to the mint (a form of legalized counterfeiting), if silver is allowed to flow freely in and out of a country, and if the official value of a penny coin is 1 d. (1/240 l.) in all countries regardless of weight and fineness, two arbitrage opportunities emerge in a monometalist monetary system (these opportunities are multiplied in a multimetalist system). Mints competed for silver and silver went where more funds could be obtained. Assume that the following applies at the English and French mints for a pound of standard silver and assume that the sterling pound and French livre exchange at par (everything is measured in pound sterling). An English merchant can export 230 d. worth of sterling pennies (0.95 lb. of standard silver) to the French mint and get 335 d. worth of French pennies (0.95lb.*360d./lb. – 0.95lb.*10d./lb.). The merchant can then import the French pennies (deniers) to the UK for a profit of 105 d. This is true as long as French penny coins are allowed to circulate in England at 1 d. even though they are much lighter than sterling pennies (1/360th lb. compared to 1/240th lb.). The profitability of the operation is multiplied if fineness differs among mints; it also would be influenced by changes in the foreign exchange rate (in the example above the arbitrage is profitable until 1 livre = 0.687 pound sterling or less so that French pennies circulate at 0.687 d. in England). The catch of course is that the French penny coin would not be current in England, not only because of the improper weight (and/or fineness), but also because of quite different marks (counterfeited sterling pennies were made abroad to bypass this problem and the exchange rate risk). Merchants and others were supposed to bring all foreign coins to an official English mint to be reminted to the official specification. In doing so, merchants would incur a loss (of 105 d. in the previous example) so they had little incentive to remint the foreign pennies they earned. While technically forbidden, the circulation of foreign pennies was quite common and at times tolerated by the king given the lack of coins, which disturbed the English monetary system. Sterling pennies disappeared and were replaced by foreign pennies (or counterfeited pennies) that were much debased in weight and fineness. Kings usually did try to fight this arbitrage because their reputation was at stake. Capital controls were put in place, together with market regulations to prevent domestic transactions with foreign pennies. These policies were of limited effectiveness, cumbersome to implement, and did not deal with the core problem. 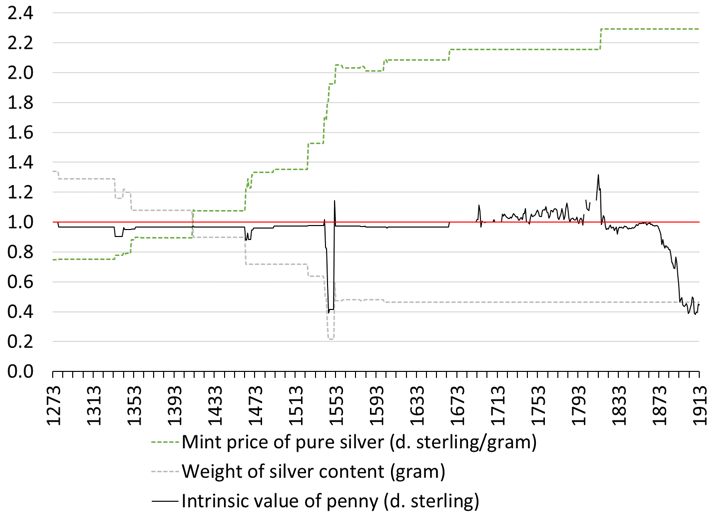 In order to eliminate the profitability of the international arbitrage, the English mint could do only three things; one was to raise the standard mint equivalent and mint price and/or lower the fineness of silver in the sterling penny coin; a second was to lower gross seigniorage (raise the mint price but leave the mint equivalent unchanged); and/or third was to cry down foreign pennies. The first solution debased the coinage but the English parliament was reluctant to allow it. It was also hard to implement in a multimetalic system without disturbing the relative mint price, which would create arbitrages across metals. The second lowered the profitability of minting and the King would see his finances suffer. The third option burdened debtors and tax farmers given that courts followed nominalism (the English judicial system was an early adopter of the nominalistic principle). An illustration of the third option is provided by Edward I who declared all foreign pennies to be worth 0.5 d. on Christmas day of 1299 (he would only accept them at 0.5 d. in payments of taxes and other royal dues). Intrinsic value = 230 d. per lb. * 1/240 lb. = 0.95 d.
Intrinsic value = 360 d. per lb. * 1/240 lb. = 1.5 d.
The face value of the penny is still 1 d., because the government follows the official unit of account (1 l. = 20 s. = 240 d.) when accepting and making payments. If nothing is changed, the penny disappears by being exported to other mints or sold to individuals with the ability to extract the silver for non-monetary uses (plates, silverwares, jewelries, etc.). While today, it is not possible to arbitrage away the difference, it was relatively easier to do so in the Middle Ages. To prevent this arbitrage, a King could cry up the official value of the penny to match the intrinsic value, or could debase the penny to lower its intrinsic value. Table 2 shows that the penny was never cried up, its official value always stayed at 1d. Crying up the coinage was more frequent for gold coins whose weight was considered a crucial anchor (for example the gold florin in international transactions). The figure below illustrates that the second option was followed for the sterling penny coin. As the price of silver rose, the silver content of the coin fell by an amount just sufficient to maintain the intrinsic value of the penny at about 1 d. The mint moved the mint price of silver and the silver content of a penny coin in opposite position in order to maintain the intrinsic value close to its official value. In doing so, the mint defended the coinage against a domestic arbitrage. This did not prevent other forms of arbitrage as explained above. Note: The full intrinsic value should also include the value of the alloy (usually copper). Note: The market price of silver is not available for the period 1273-1692, became intermittently available from 1693-1717, and was almost continuously available from 1718. The market price of silver was probably different from the English mint price but does not seem to have deviate too much from it. From 1693 to 1815, the market price for a pound of pure silver was on average 43.8 d. above the mint price, which leads to an intrinsic value on average 0.18 d. above the official value. This assumes that penny coins maintained their official weight, when the actual weight of penny coins was usually lower. Note: The picture shows the first sterling silver penny. It was issued by King Offa of Mercia in the late 8th century. To conclude, given the way a monetary system is set up, it gives rise to more or less arbitrage opportunities. While authorities have used means to make these arbitrages unprofitable or to forbid their implementation, they have not been able to prevent individuals to hoard undervalued coins in anticipations of the ability to implement the arbitrage. We witnessed that with the medieval silver penny, we are witnessing it now with the U.S. copper penny. The existence of this monetary arbitrage originates in a debate regarding the nature of monetary instruments. Since Roman time at least, authorities have emphasized the centrality of tale over weight as the anchor for the coinage. In medieval times, this view conflicted with the practices of international trade (coins circulated by weight), the courts that follow metalism (continental Europe), and even at times the practices of the Crown (King refused current pennies that deviated from official weigh or asked for compensations to offset the difference). Ultimately nominalism won; a penny is worth 1 d./1 ¢ and the quantity of metal ought to be irrelevant for valuation. Debasement or reinforcement do not change the value of a coin. Coin bearers have been willing to agree as long as intrinsic value stayed at or below official value. With the rise of nominalism came the recognition of the centrality of liquidity (stable nominal value of monetary instruments) for a well-functioning monetary system. Preoccupations about the purchasing power stability of monetary instruments ought to be accommodated by other means than the making of money. *I thank James L. Bolton for helpful comments. This entry was posted in Eric Tymoigne. Bookmark the permalink. “twice as less” = half as much? Not sure what is . You will need to be more specific. This is fully consistent with Innes credit view though. The official value (1d) is supposed to be the price at which the coin circulates as long as the king is trustworthy. He is supposed to accept his coins at 1d when people pay royal dues. Some may find the terminology and definitions confusing or misleading or too brief – too close to usual mainstream writing with the commodity theory lurking. IMHO, this is a point where it pays to be very pedantic and “MMTically correct” even to the point of verbosity and clumsiness. While the post recognizes it in places, it does not emphasize that “intrinsic value” for precious metals is not “metallurgic value”, or some independent “market value” but is driven by their monetary uses, their use to represent a nominal unit of account. Precious metals are useful as money precisely because they are not very useful for anything else at the levels of real scarcity. Governments have been the driving force in setting their “market value”. So emphasizing that everything is fundamentally “nominal”, that anything else is logically impossible, and that Kings and Constitutions have no power to change that, as Innes does, might help. On this view and meaning of the word, nominalism cannot win or rise because it can’t lose, fall or even change. Deeming money-things to be coins with some silver in them or instead, quantities of silver (which may be measured with, equated with some necessarily “nominal” unit of account) does not change that. One isn’t more “nominal” than the other; they’re just two somewhat different “real” things. They all played a role in monetary dynamics. Kings aimed at keeping coins in circulation at the official value. People checked if official value or intrinsic value gave more of the unit of account (nominal calculation). Weight was used where king areas of influence was weak, or if courts and king followed metallism. There is also an intermediate case where king would accept current coins at face value but only after checking weight and asking for compensation if coins are light. Yes to this comment. Also, I agree that it is not the point of this essay and that you know what you are doing, that it is consistent with MMT & Innes, that any MMT academic, anybody writing here at NEP should be given the strong benefit of any such doubt. And like Mel I really like anything on the mysteries of medieval money and appreciate this essay and apologize for distracting attention from with a side issue. I meant to put this in User-Friendly’s thread, since he brought it up. I was trying to explain what I thought he meant, what may have given him that idea, as I had some qualms about the language even before I saw his comment. For if one knows something too well, one might not see how it might be read by other people. A problem is that the phrase “intrinsic value” and similar ones are confusing and should probably not be used. It is not used here to mean “intrinsic” modifying “value” as both words are commonly used. That would suggests that the value is in some sense intrinsic to the quantity of precious metal, which is the commodity theory. Innes clearly, explicitly and very carefully describes how this did NOT and could not happen. Of course I agree with everything else Mel says. But all monetary systems are and always were “nominal” and Modern. Changes were cosmetic, superficial and could not be essential, and again it is clearest imho, especially in a not entirely academic work like a blog, to emphasize this and choose language that does not suggest something else, even at the cost of being exceedingly pedantic. I can understand why the English mint would enact either the first or second defence in the case of counterfeit pennies issued by French mints. But in the case of actual French pennies with their own unique markings, it seems that the easiest defence is the third, just cry them down. Presumably there would be a pre-existing foreign exchange rate between English pennies and French ones, so it would be easy for the English mint to select the right rating for French pennies by observing this rate. A theoretical problem is that we evolved into our Modern Monetary System from systems that were definitely not Modern. The gold-bugs arguing out there are a result of the evolution. I can try to refute them by bald assertion, but they never believe me, so I welcome detailed descriptions of the metal age, like this one. I think that to insist on the nominal is to miss the point of the essay. The unit of account had a fixed nominal value, but the ownership of a unit of account was indicated by ownership of a token. And the tokens could be, indeed had to be, manufactured. And the metal philosophy insisted that the street value of the token be the same as the value of the unit of account, lest counterfeiting get too easy. Hence all those shenanigans described above. References would have been nice. The Innes references are probably obvious. Theoretical I use Innes and also my own work.